Placing Belfast on the world stage for conferences and events. As digital partners to a venue that received a £29.5m upgrade, we developed a digital platform that would drive lead generation up 92% QoQ and generate £100m in economic contributions for the city of Belfast by 2021. The International Convention Centre Belfast (ICC Belfast), the venue’s new conferencing brand identity, launched in 2018 following a £29.5m investment with the aim of attracting 50,000 annual conference delegates days each year, bringing an average economic contribution of over £100m to Northern Ireland. This required attracting the likes of International Medical Summits, NGO gatherings, Tech Conferences through the website. 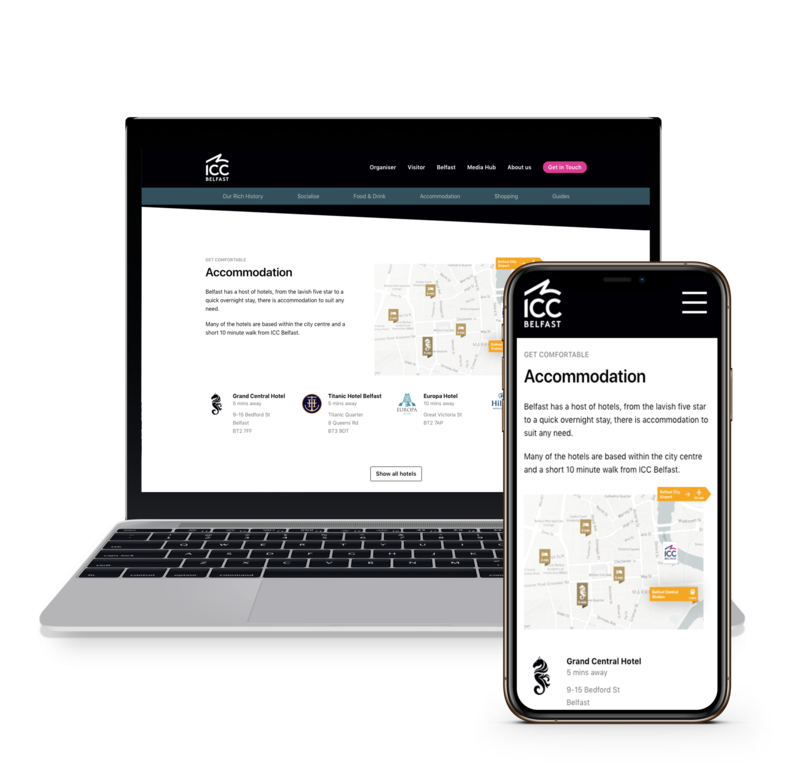 Dawson Andrews were engaged as ICC Belfast’s digital partners in building the new platform that would allow the venue to attract and retain corporate and association customers from around the world. Primary goal - drive first-contact with conference organisers. "This isn’t about design, it’s about driving leads.” - our main statement in the stages leading up to kicking off this project. Design and engineering is secondary, our primary focus was the business value this new platform would drive - harvesting leads of PCO’s and event professionals. 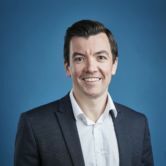 With the UK event and conference market worth £42Bn in 2016, predicted £46.3Bn in 2021 and events being held in ICC Belfast booked for five years’ time already, generating a sales pipeline was the leading goal of the platform. The following piece of work drove Lead Generation up 92% QoQ, and it is still improving. Attract 50,000 annual conference delegates days per annum to the City. Attract 35,000 (of the 50,000) out-of-state conference delegates days. Contribute £100M of Economic Impact to the City by 2020. Generate 100 enquiries a month. A 10% conversion rate on enquiries for Request for proposal. A 10% conversion rate on enquiries for site visits. "When Dawson Andrews prioritised the results their work had to deliver over everything else we knew we had found the right digital partner. If you get a chance to work with DA, take it." A Product Architecture designed for PCO’s - how does a PCO choose their 2025 venue? When one sale could be worth £2.5m to the city, it was crucial we understood who PCO’s were. We had to learn demographic habits. e.g. How does the Head of Events for the world’s most famous medical summit make their venue choice for 2025? When last year they were in Hong Kong, and this year they are in Atlanta, how do we take them on a journey that finishes with them choosing Belfast for 2025? This research allowed us to create a product architecture designed to highlight a PCO’s top deciding factors in choosing a venue; Accessibility, Venue Suitability, Value for Money, Destination Appeal. Not only must a PCO be confident that the venue is suitable for the event, but the city and beyond must be suitable for the delegates and their needs. Each conference and event is unique so we categorised the high-level concerns. Through researching past enquiries the team were able to prioritise the frequently asked questions and address them above the fold before visitors went looking for their answer. What will my delegates do when outside of the conference? Where will my delegates stay? Where will my delegates park/hire cars? How far from the airport do my delegates need to travel? Content was prioritised by the research findings that rated ease of access number one (82% of the time this ranked in the top three concerns (989 votes) closely followed by suitability of venue at number two - 71% of the time this ranked in the top three concerns (693 votes). Many event types and needs were identified however after mapping customer journeys we realised that every use-case could be filtered down by Event Type and Attendee Numbers. By choosing these two options we were able to filter information by relevance in a matter of seconds. By decreasing the filtering time we increased the click-through rate into specific venues, likely due to the simplicity of the function. As the second most used feature on the homepage, we now know that flights and accessibility are well and truly at the top of a PCO’s priority list. Our research showed accessibility in the top three choice-criteria so we attempted where possible to answer their questions before they needed to ask. Sometimes the little things like a simple widget have big effects. We integrated the site with Google Analytics, Google Optimise and Hotjar for screen recording once the new website was live. KissMetrics & Mixpanel were sidelined for the time being however we might end up using things as the product grows. A series of tests continue to run on the most important pages where we’re optimising design and performance to drive enquiries. Intercom and Drift are our preferred live chat solutions that we would recommend. We have completed countless installs of both options (and others) and can advise on costings. 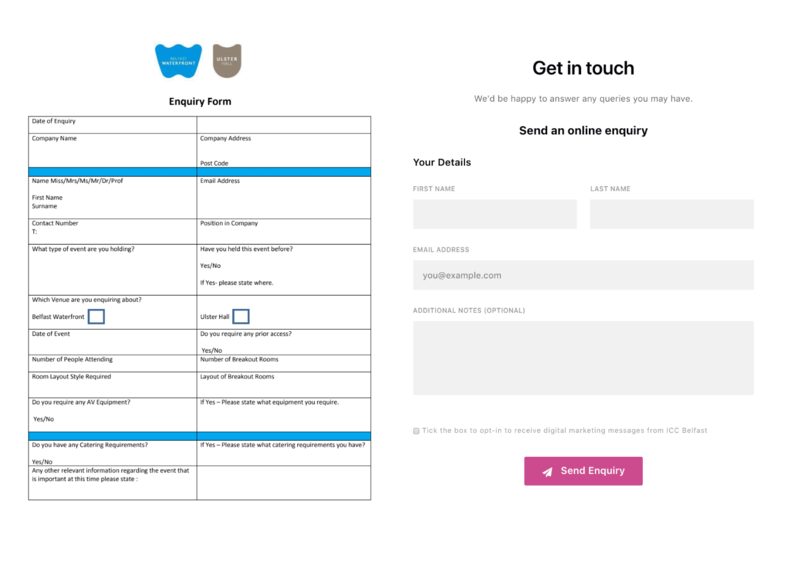 In areas where interaction is of the most importance (getting in touch) we deployed A/B testing on a few designs to see which performed best. 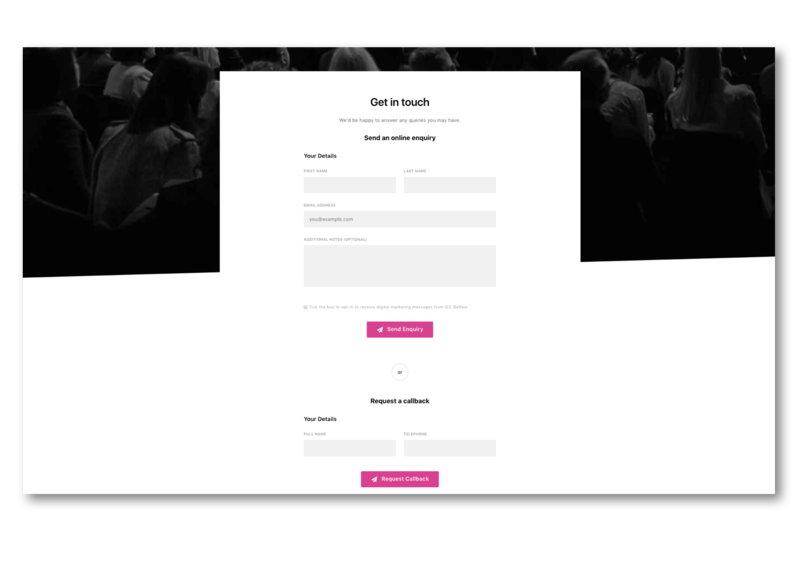 The below test was looking for the optimal contact-us page where we tried different layouts moving the ‘Request a callback’ form above and below the main contact form. Where the previous form’s remit was to gather information, the new solution was to grow engagement. The existing enquiry form demanded more effort than was necessary. By removing the unnecessary information such as ‘date of event’ we created a quicker connection for a PCO to the ICC Belfast account management team. Often dates aren’t yet decided, it’s unknown how many rooms are required, and what the catering requirements will be, especially considering events are being booked 5+ years in advance. CMS’s don’t historically have good reputations internally - they’re often seen as clunky, confusing, and only usable by those who understand ‘that technical stuff’. We’re strong believers that a good CMS can be a joy to use by all technical abilities. A system designed with specific roles in mind, rolled out in an interactive training environment where no one is left behind is key to getting internal buy-in. We were aware that a complex CMS (with custom code) can create vendor lock-in - we wanted to avoid this at all costs and ensure everything we did included widely documented frameworks that any web professional or organisation can pick up from where we left off. We chose Craft CMS for the simplicity and flexibility that a multi-skilled team needs. We chose it for its modular functionality that allowed the marketing team to craft their own editorial design by giving them the right tools and flexibility. Working backwards from a solution we found that in order to empower the marketing and digital team, we needed to have a bank of pre-made rules rather than templates. Working off previous releases and content produced we were able to bring a facelift that coincided with the brand. At Dawson Andrews we design digital products that drive business value. We're building a Product Playbook that covers our approach to everything. It is currently an internal tool but we're opening it up slowly to a small group of Beta testers in 2019.